I don’t like being ripped off! Posted by Andrew Whyman under Electronics, Rants, on 17 November 2013 @ 1:16am. A few weeks ago I bought some 81650 Lithium Ion batteries off eBay as I wanted to test them in a number of applications for some possible future projects. Before buying I had read some reviews on how poor these batteries often are in yielding the rated capacity, but I found a few sellers on eBay that didn’t have many negative feedback and decided they would probably be OK. I went ahead and bought them, and week later they turned up. I already have a smart lithium charger that was capable of telling me the capacity of the batteries when they had been charged (basically how much power it had put in them during the charge cycle). This is all I needed to test them but I also recently got a power meter that could do the same when discharging them too. I set to work trying to check them but immediately I knew something was wrong. I started a discharge with a 0.5A load and the voltage dropped very quickly. I first thought this was due to them being flat already so I decided to put them on charge first. I set the charger up for 3000mAh capacity and a maximum 3A charge rate, which is normal for these batteries. I set the charger going but immediately the voltage hit 4.2v and only pushed about 0.4A into the battery. I gave it the benefit of the doubt and let it charge anyway. My limited experience shows Ultrafire have low capacity compared to Trustfire. Not all scenarios might turn out this way. 15 minute later the charger beeped to say it was fully charged. That was way sooner than I expected. I looked at the charge capacity and it was small. I don’t remember the figure but it was under 150mAh. So anyway I repeated my original test and let it run at 0.5A for a little while. The same voltage drop happened but I let it run. Less than 30 minutes later the batteries were showing 2.5v/cell, which is dead. My discharge meter read 210mAh! This is over 20x less than the rated capacity. I repeated the charge and discharge test a few times to be sure but it wasn’t changing. As it turns out, these batteries were all duffs. They likely came out of old laptop batteries or similar, got re-labelled and shipped out as new. It’s safe to say I was pretty miffed at being ripped off. I wasn’t going to get stuck with them so I contacted the eBay seller who was happy to help. He asked me how I tested them so I told him and I even gave him the make and model of my charger and power meter. He didn’t argue he simply asked if I’d like a full refund, to which I agreed. He didn’t even want the batteries back. Something tells me he knew they were bad, despite the fact he told me he’d never had returns on them before. All 4 batteries that I had bought came out the same. Had it been one bad one I wouldn’t have been too bothered. Anyway, I was refunded on the duff batteries so I set about looking for better ones. I decided to look on one of my favourite online shops, dx.com. I’ll be up front and say it’s a Chinese site but with a difference. The stuff they sell is actually half decent and they are much lower priced than other places. I’ve never had a bad purchase from them to date and I’ve bought a dozen things from them. It didn’t take me long to find some batteries on there with good reviews. They claimed 2400mAh out of the rated 3000mAh. While not perfect it was a lot better, and the reviews were from people who had bought them too so I was inclined to follow them. Knowing the site has been good in the past helped too, so I didn’t hesitate to buy them. They took about 2 weeks to arrive and they came today. I did a quick initial charge, and then set about discharging them with the same 0.4-0.5A load I did with the others. It took a while, but I eventually ended the discharge test with a 2300mAh result. I then charged them and got the same amount put back into the batteries. 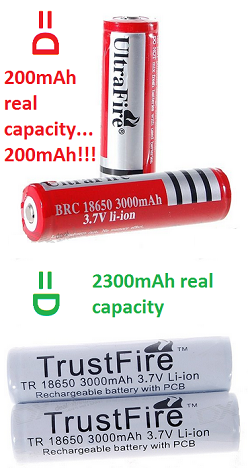 In case you’re wondering, I originally bought “Ultrafire” batteries which are cheap knock-offs of the “Trustfire” ones I bought in the end and they worked. My advice here would be to steer clear of Ultrafire and stick with the better brands like Trustfire. Better still, you could buy Sony batteries or another well known brand.